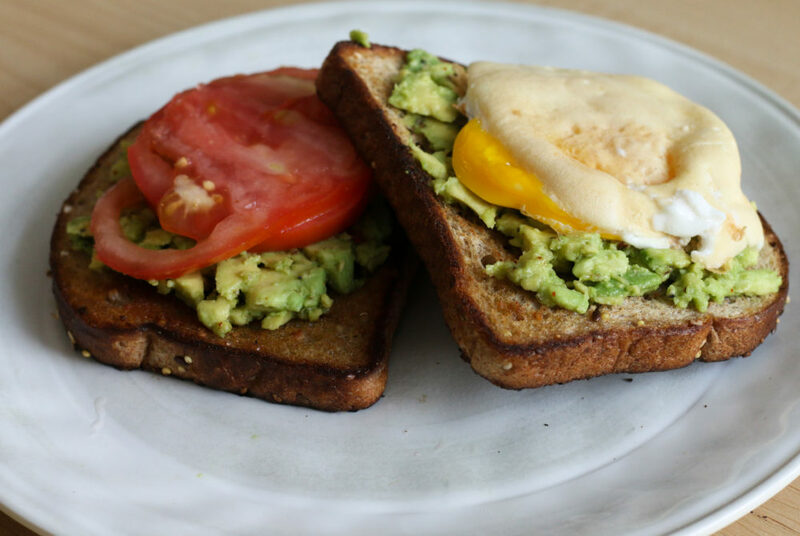 Students with a kitchen can make avocado toast and upgrade the simple recipe with fresh tomatoes or an egg. You won’t have the luxury of your mom’s cooking when you are stuck with a college kitchen. Each residence hall has a different kitchen situation, so students will vary in how much cooking they can commit to. But whether you have a cramped shared kitchen or just a desktop and a microwave to work with, you can still whip up basic and affordable recipes. Overnight oatmeal is the perfect breakfast option if you want to sleep in for a few extra minutes, but still be fueled up for your 9:35 a.m. class. In a small plastic or glass reusable container, mix about 1/2-cup of rolled oats with 1/2-cup of milk of your choice. For a slightly sweeter breakfast, add a teaspoon of honey, maple syrup or brown sugar before cooling the mixture. For a little spice, sprinkle in a pinch of salt and cinnamon. Overnight oatmeal dressed with fresh toppings can be made in a residence hall without a kitchen. Mix the oats, milk and any added spices gently and cover the container before refrigerating overnight or for about six hours if you’re pulling an all-nighter. In the morning, simply remove the cover and pop the mixture into the microwave for about 30 seconds. 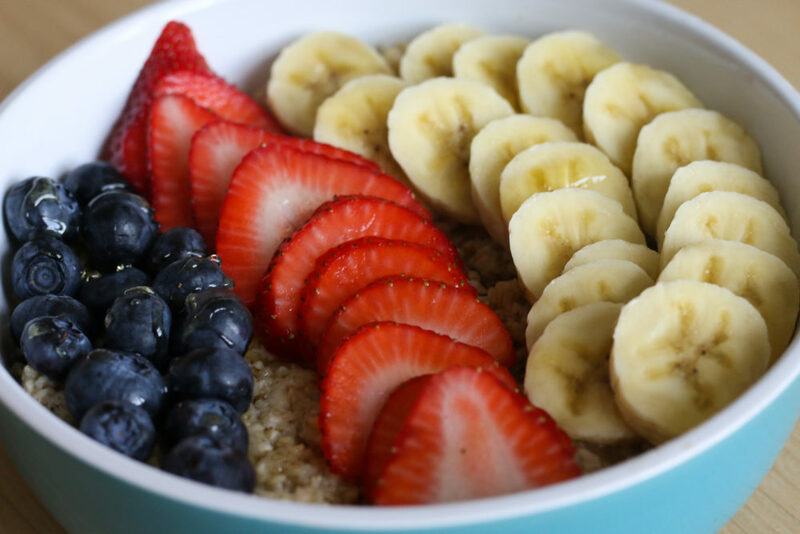 To dress up your breakfast, consider chopped walnuts, strawberries and blueberries for toppings before plopping down at your desk. When you’re done, a piping-hot medley of creamy oats and sweet berries awaits. For a filling snack that is easy to put together, try a play on a peanut butter and jelly sandwich that’s lower in carbs. All you’ll need is two rice cakes, peanut butter and strawberries. Spread a thin layer of peanut butter on each rice cake. Then, slice about five strawberries so they are flat. Carefully place the strawberry slices on top of the peanut butter. You can either eat the snack open-faced, or smush two rice cakes together for an extra crunchy sandwich. There is no reason to break the bank on a $10 slice of avocado toast when you can make several helpings for the same price – and make it just as Instagram-worthy. Gradually heat a tablespoon of olive oil in a pan over medium heat. Take two pieces of whole wheat bread and set them in the pan. Let them sit for about two minutes before turning them over. As you wait for the toast to get nice and crisp, take one semi-soft avocado and slice it into two pieces. Using a knife, crack into the pit and twist it to remove, then scoop out the rest of the avocado into a small bowl. Then using a fork, mash the fruit until it is slightly chunky and spread it on the toast. For seasoning, add a pinch of sea salt and a crack or two of pepper on each slice. For a little extra spice, try adding a pinch of red pepper flakes. If you’re looking for a tangy flavor, squeeze in a bit of lime or lemon juice. Then you can dig in, or add some sliced tomatoes or a sunny-side-up egg on top if you’re feeling fancy. The District’s hot summer weather will continue through the school year, but cobbler, a dessert baked with fruits and a thick crust, is the perfect dessert as D.C. slowly approaches fall territory. Perfect for small gatherings and dorm room potlucks, the cobbler’s base is a simple mixture of blackberries, peaches and a small handful of flour. If you use frozen fruits, the dish is even easier to make. For the topping, mix equal parts olive oil, oats, flour and brown sugar depending on the size baking dish you are hoping to fill. Add a handful of chopped pecans and a teaspoon of cinnamon and nutmeg. Spray a baking pan with non-stick spray or coat the surface with olive oil. Then place the fruit base in the pan and sprinkle on the topping. At 350 degrees, bake the cobbler for about one hour. If the top is golden-brown, you can get ready to dig in. Once you divvy up your dessert, top each serving with vanilla ice cream or Greek yogurt, and your guest will be in awe when they find out this pristine dessert wasn’t shipped from your parents.